Rick Alsop made 1st place at the Falling Walls competition and will represent McMaster and Canada in Berlin in November. Congrats! While in Germany we are visiting Tim Salditt's Lab at the University of G�ttingen. We are attending the European Biophysics Congress EBSA2015 in Dresden. Jennifer Tang won 1st Prize in the oral student competition in the Division of Medical and Biological Physics at CAP in Edmonton! She was then one of the 8 finalists for the overall competition and won the CAP BEST STUDENT ORAL PRESENTATION COMPETITION!!! Congratulations! Jenn Tang's work in Alzheimer's disease is featured on Physics World! Jennifer Tang and Maikel Rheinstadter are attending the 2015 Congress of the Canadian Association of Physicists (CAP) in Edmonton, Canada. Maikel was serving as the Chair of the Division of Medical and Biological Physics. Jenn Tang has just started to work in the lab during summer for her USRA project! 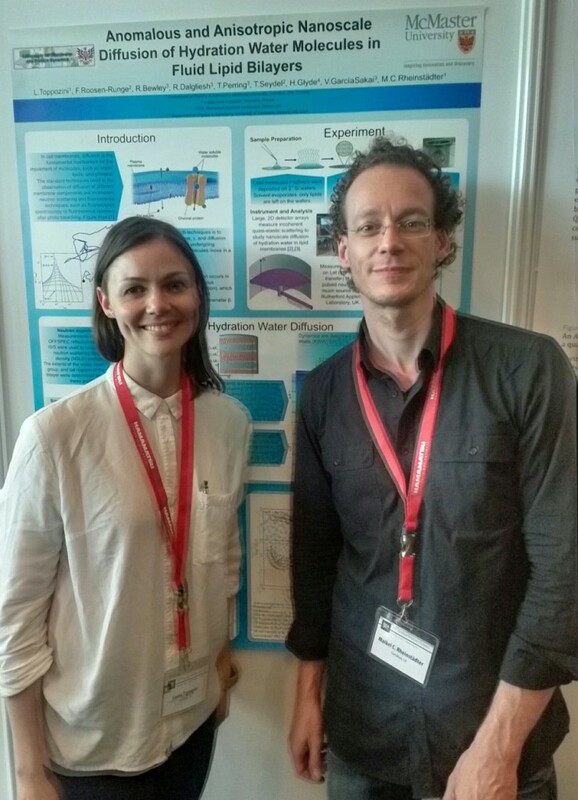 Laura Toppozini presented her latest project "A 2-dimensional Diffusion Map of Membrane Hydration Water" at the Chemical Biophysics Symposium 2015 in Toronto. 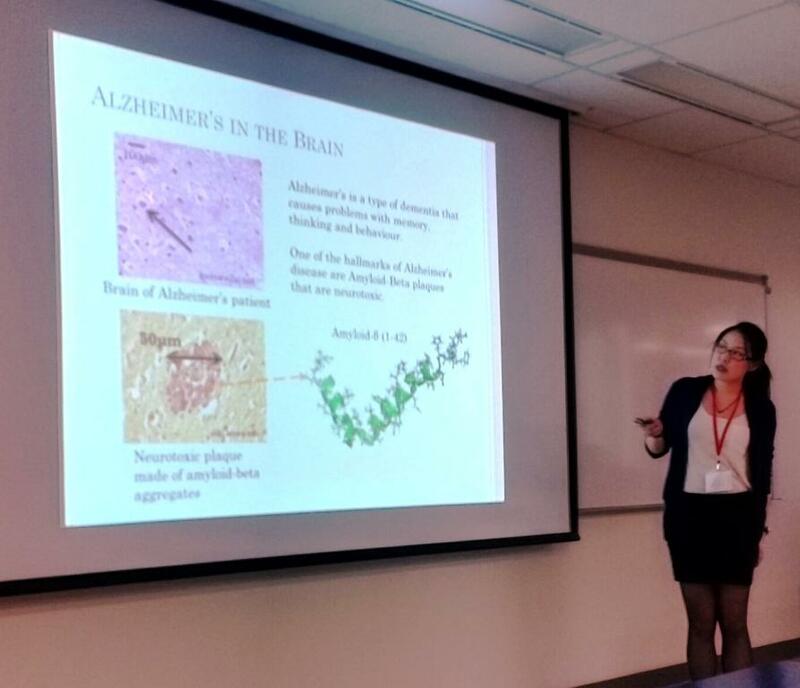 Jenn Tang presented her project "The Formation of Alzheimer's Plaques in Synthetic Membranes" at the Chemical Biophysics Symposium 2015 in Toronto. Asfia Soomro presented her research practicum project "Hair as a Diagnostic Tool" at the Chemical Biophysics Symposium 2015 in Toronto. Lily Zhang presented her thesis project "X-ray Study of Human Hair Structure" at the Chemical Biophysics Symposium 2015 in Toronto. 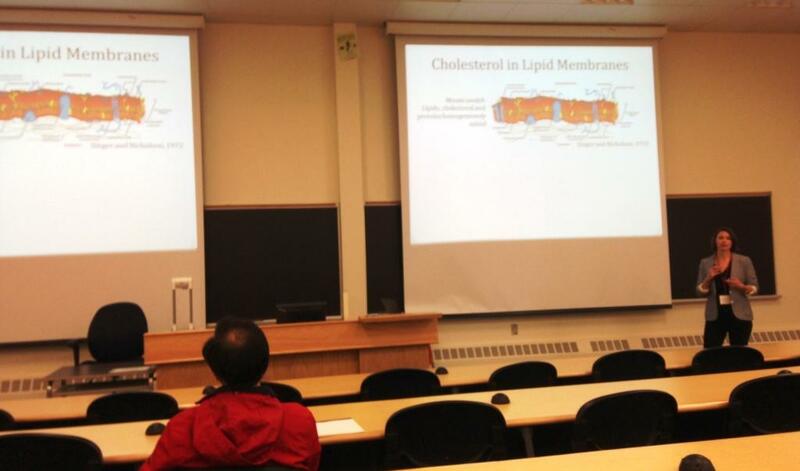 Rick Alsop talked about "Aspirin Inhibits the Formation of Cholesterol Rafts in Fluid Lipid Membranes" at the Chemical Biophysics Symposium 2015 in Toronto. 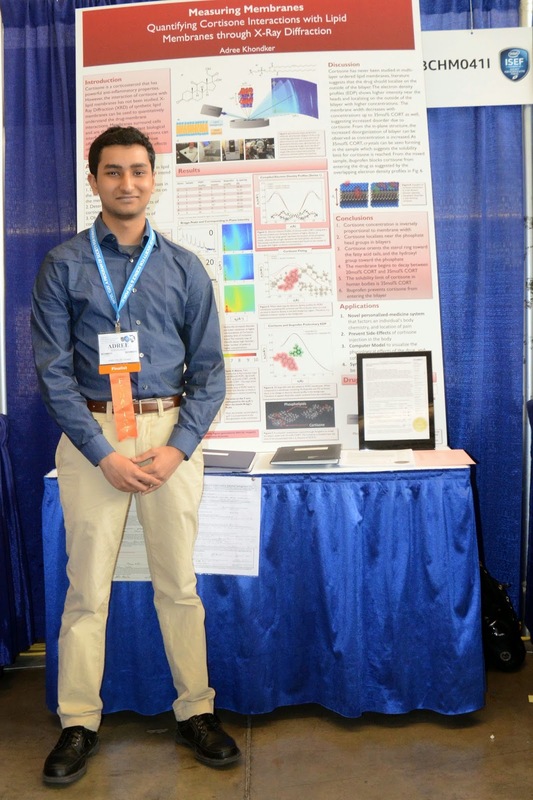 Adree Khondker made third place at BASEF 2015 with the project 'Membrane-Based Medicine: Quantifying Cortisone Interactions through X-Ray Diffraction' that he conducted in our lab! 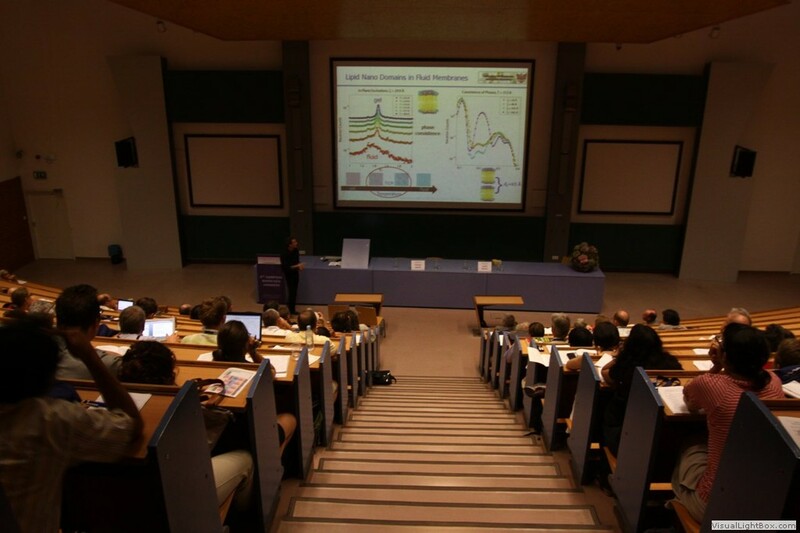 Adree Khondker presented his project "Quantifying Cortisone Interactions with Lipid Membranes through X-Ray Diffraction " at BASEF 2015. 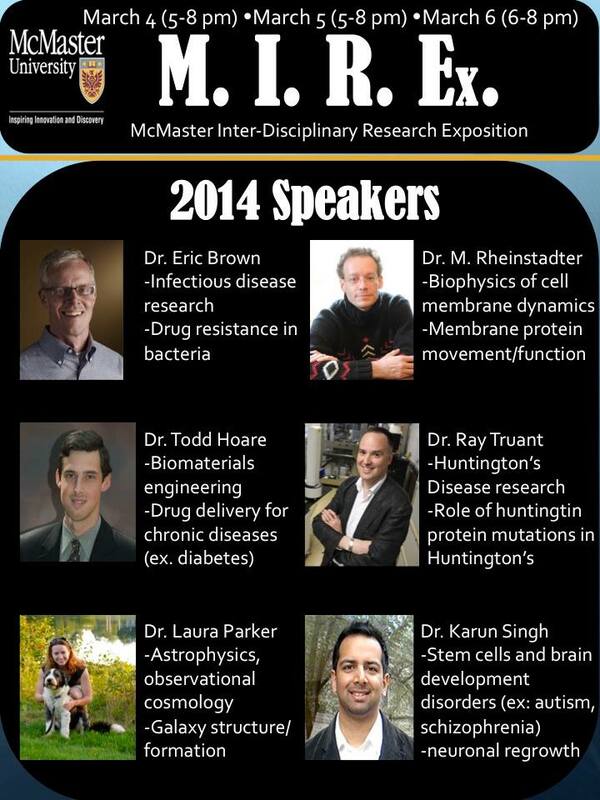 Dr. Rheinstadter was invited to speak at the Integrated Science Symposium 2015 at McMaster. 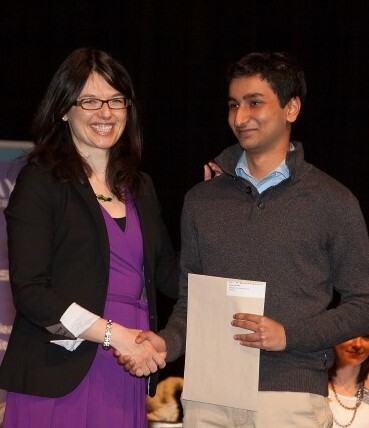 Richard also was awarded an NSERC PGSD scholarship. Congratulations; well deserved, Rick! 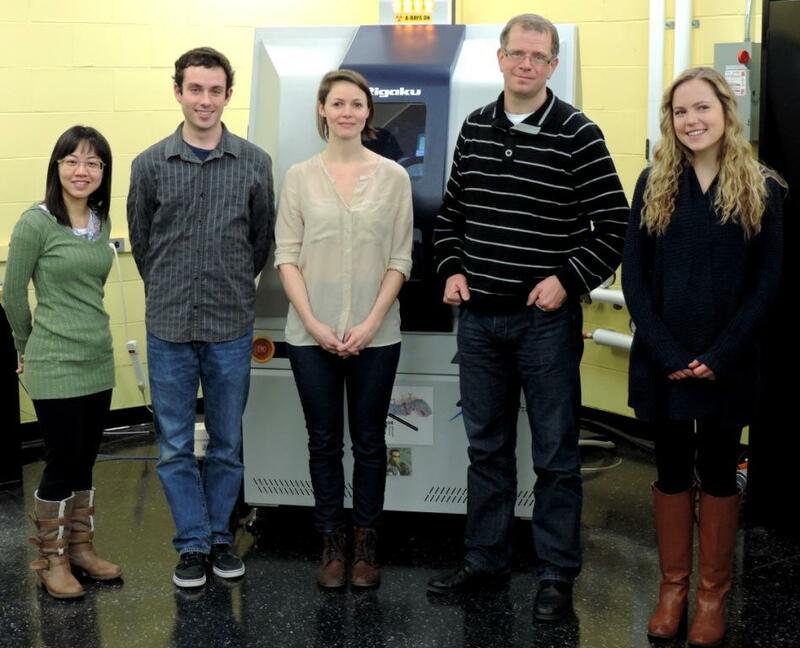 Former lab member Hannah Dies was awarded a prestigious NSERC Vanier scholarship. Congratulations, Hannah! Maikel was invited to "Mechanistic Studies in Membrane Biophysics: Experiments and Theory" in Telluride CO, organized by ﻿Ed Lyman and Peter Tieleman. Thanks for having me for this great workshop! Jenn Tang and Mindy Chapman presented their work at the Canadian Conference for Undergraduate Women in Physics (CCUWIP) at the Universit� Laval, Qu�bec, QC. 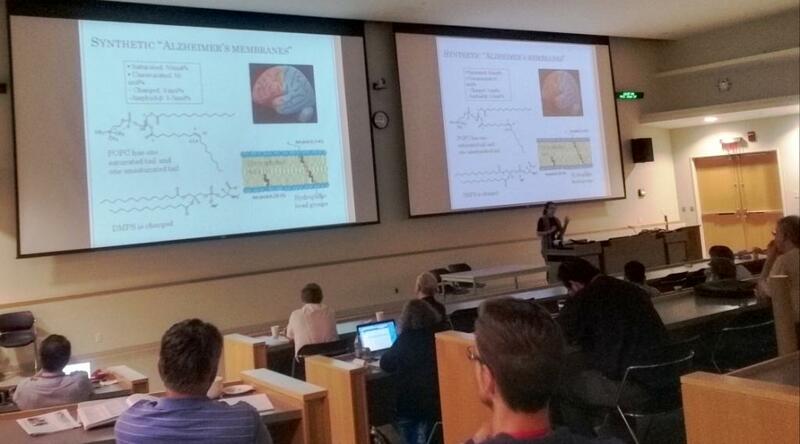 Jenn talked about "The Formation of Alzheimer�s Plaques in Synthetic Membranes ". Mindy's poster was titled "Formation of RNA from nucleotides in different environments". Congratulations! 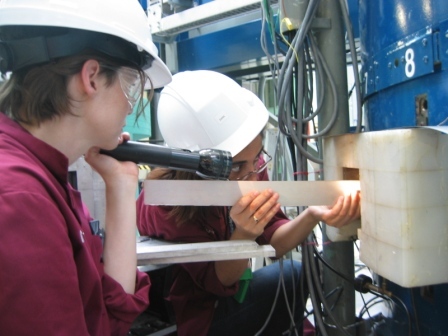 Jenn and Maikel are conducting a neutron experiment at the Institut Laue-Langevin in Grenoble, France! Big thanks to Karin Schmalzl for having us! Fei-Chi Yang is now officially Master Fei-Chi! Congratulations, well done!!! 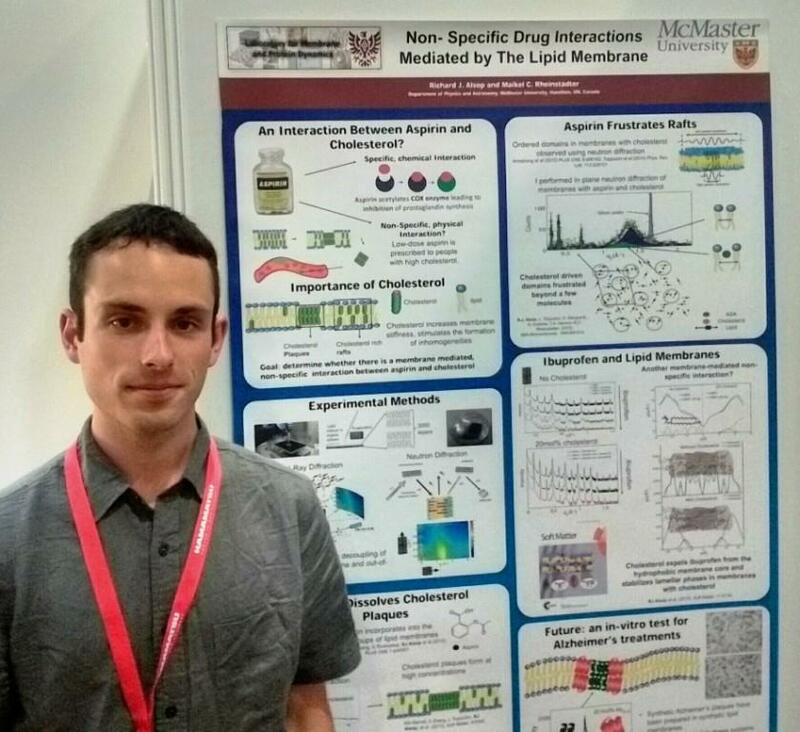 Richard Alsop won first prize for his poster "The Interaction of Common Drugs with Lipid Membranes" presented at the Fourth Annual Niels Bohr International Academy Workshop-School on ESS Science, November 10-14 in Copenhagen, Denmark. Congratulations, Rick!!! 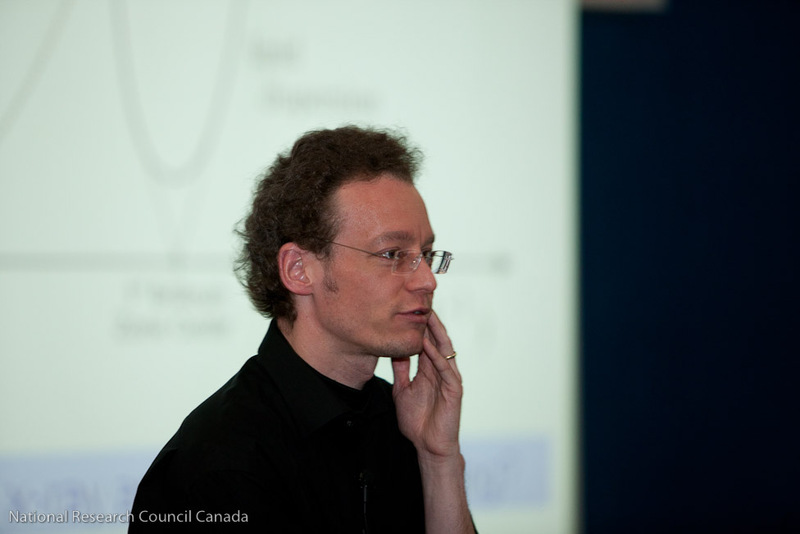 Prof. Rheinstadter is invited to give the Colloquium in the Department of Chemical and Physical Sciences at the University of Toronto-Mississauga. Thank you very much for the invitation! Jenn Tang presented her summer research today at the NSERC USRA poster session. Congratulations, Jenn, well done! 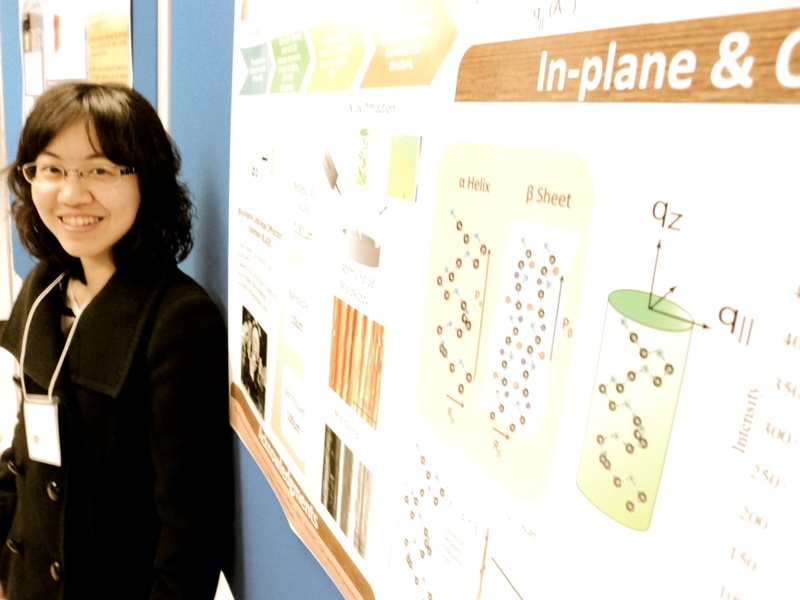 Fei-Chi Yang successfully defended her Master's thesis "X-Ray Scattering of Biomaterials". Great job, Fei-Chi! Congratulations!!! 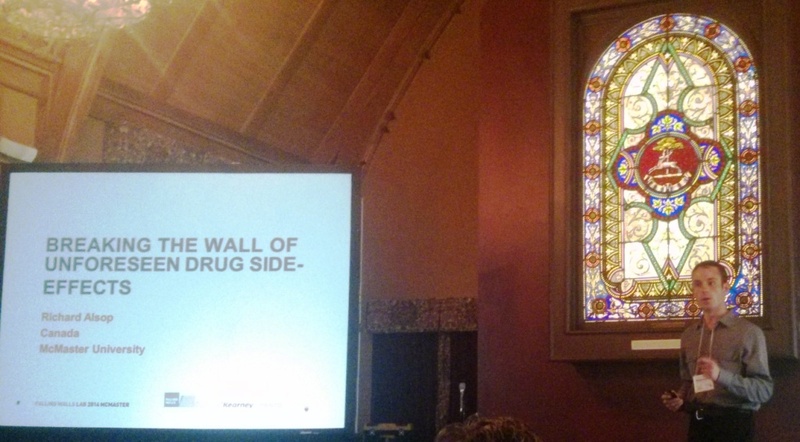 Rick Alsop was Breaking the Wall of unforeseen drug side-effects at the McMaster Falling Walls competition. 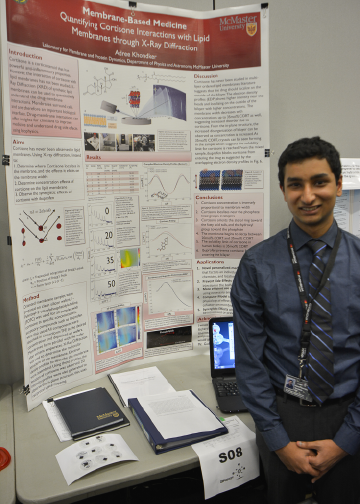 Rick Alsop made 1st Place for his Oral Presentation at the 2014 CAP Congress in the Division of Medical and Biological Physics. Congratulations, Rick! Laura, Fei-Chi, Hannah, Alina, Rick and Maikel are at the 2014 CAP Congress in Sudbury and talking about their projects! 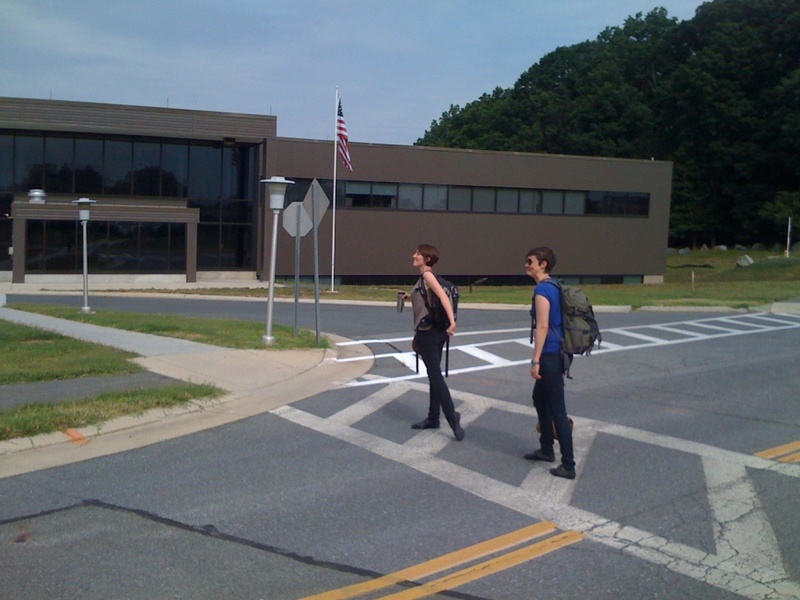 Laura, Fei-Chi, Rick and Maikel are visiting the Spallation Neutron Source at @ORNL in Tennessee. Laura, Fei-Chi and Rick are presenting at the American Conference on Neutron Scattering (ACNS) in Knoxville, Tennessee. Great job, team! Jennifer Tang joined our team. She will use her NSERC-USRA to investigate the structure of amyloid peptides in Alzheimer's plaques. Welcome, Jenn! 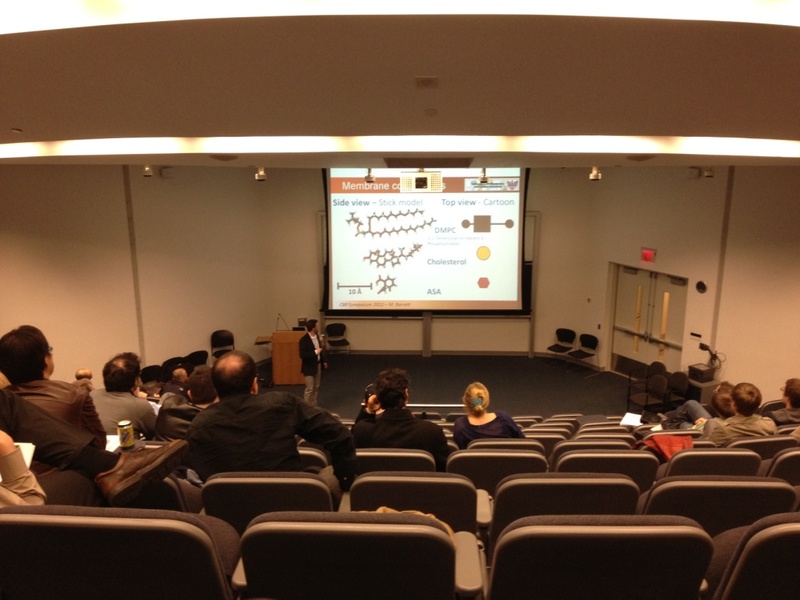 Laura, Fei-Chi, Rick, Hannah, Jenn and Maikel were presenting at the Chemical Biophysics Symposium 2014 in Toronto. Another great Symposium; thanks for organizing and having us! End-of-term lunch. Thanks ton for another great year!!! Fei-Chi Yang was awarded the Franke Dennee Scholarship 2013-2014. Congratulations, Fei-Chi! Well deserved! Hannah Dies presented her thesis "Amyloid-b protein interactions in biological membranes". Congratulations, Hannah! Well done! Rick explained at the APS March Meeting in Denver, CO, that "Aspirin Increases the Solubility of Cholesterol in DMPC Membranes". Well done, Rick! 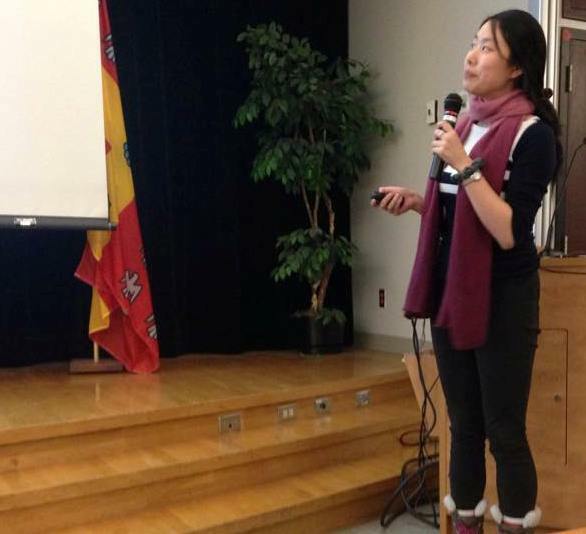 Fei-Chi spoke at the APS March Meeting in Denver, CO, about her project "Hierarchical, Self-Similar Structure in Native Squid Pen". Congratulations, Fei-Chi! 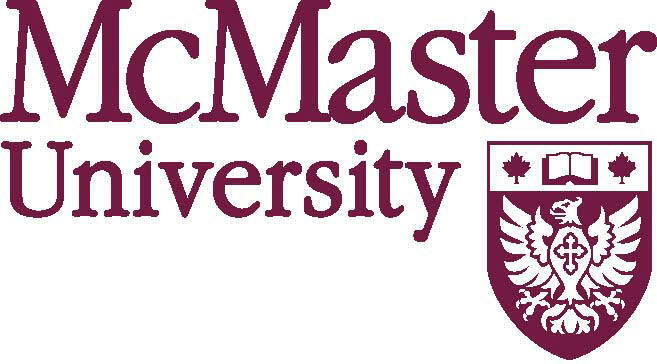 Dr. Rheinstadter was invited by the McMaster Life Science Society to speak at the McMaster Inter-Disciplinary Research Exposition. Thank you very much for the invitation! 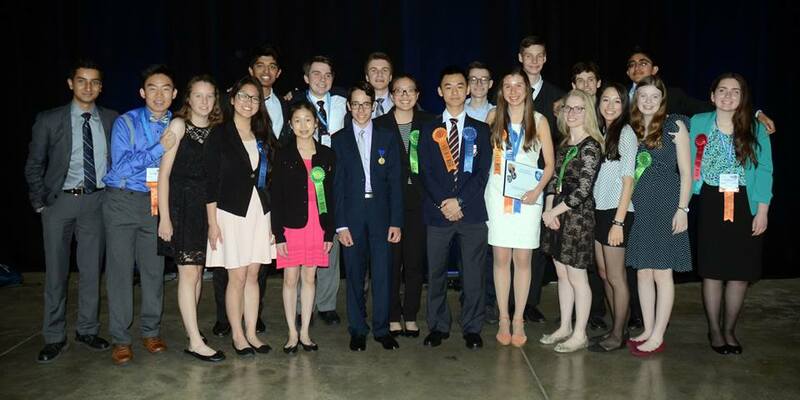 Laura Toppozini made 1st Place at Neutrons in Biology and Biotechnology NIBB2014! The price was awarded by Nobel Laureate Tim Hunt. Congratulations, Laura!!! 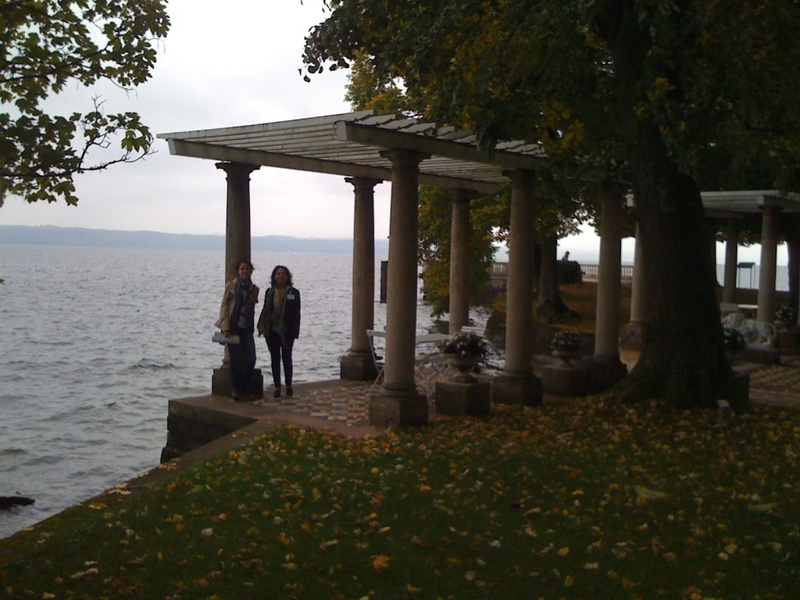 Laura and Maikel at the Institut Laue-Langevin, the word's most influential center for neutron research. Mille Thanks Karin for the tour! 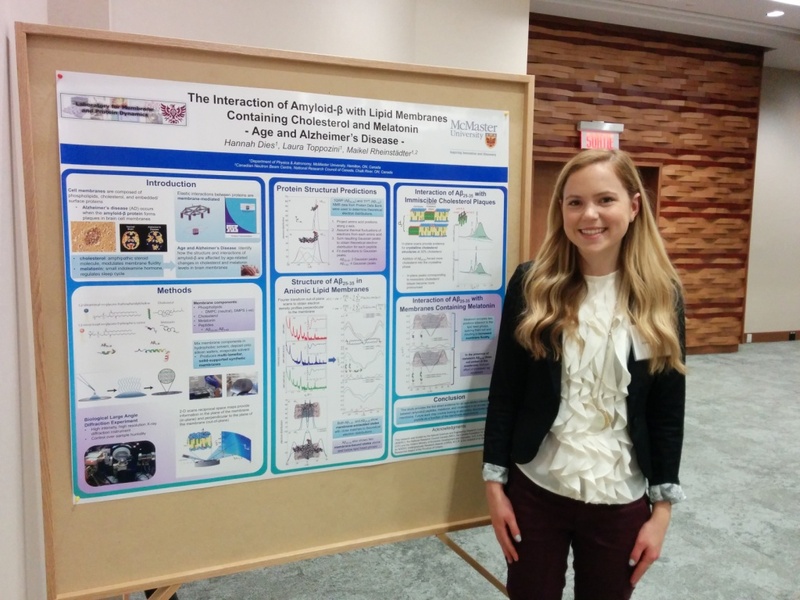 Hannah presented her Alzheimer's project at the Canadian Conference for Undergraduate Women in Physics (CCUWiP) at McGill. Awesome poster, Hannah!!! Happy Holidays! 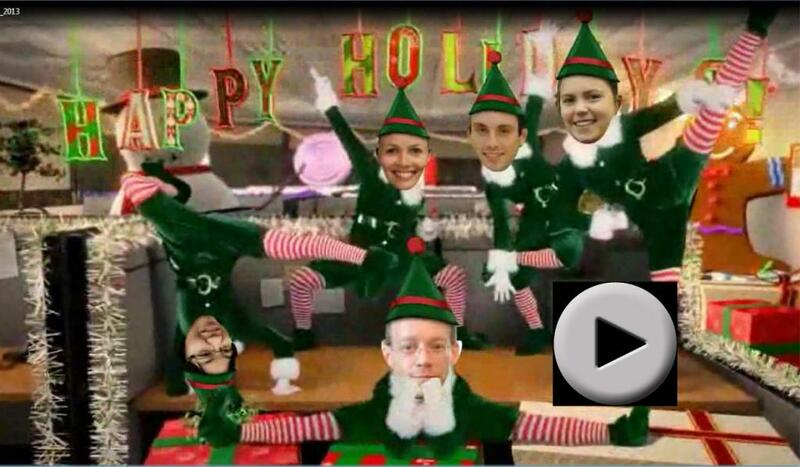 Elves are around, give them a click! 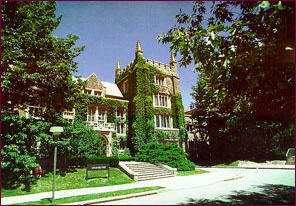 Prof. Christian Wagner from Saarland University was visiting McMaster and giving our Physics and Astronomy Colloquium. 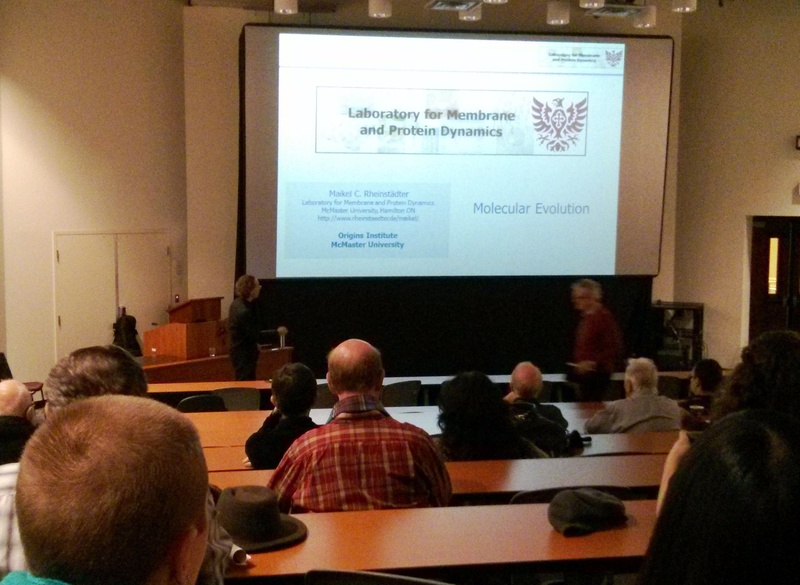 Dr. Rheinstadter is giving this week's Origins Institute Colloquium and is talking about "Molecular Evolution". 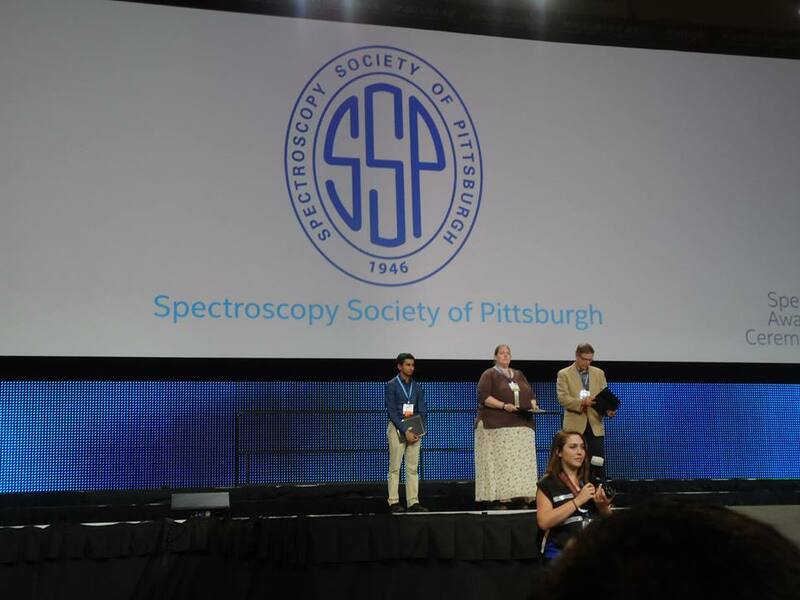 Hannah made 1st place at the CUPC2013 for her talk in the area of Biophysics/Soft Matter. Epically awesome, Hannah!!! 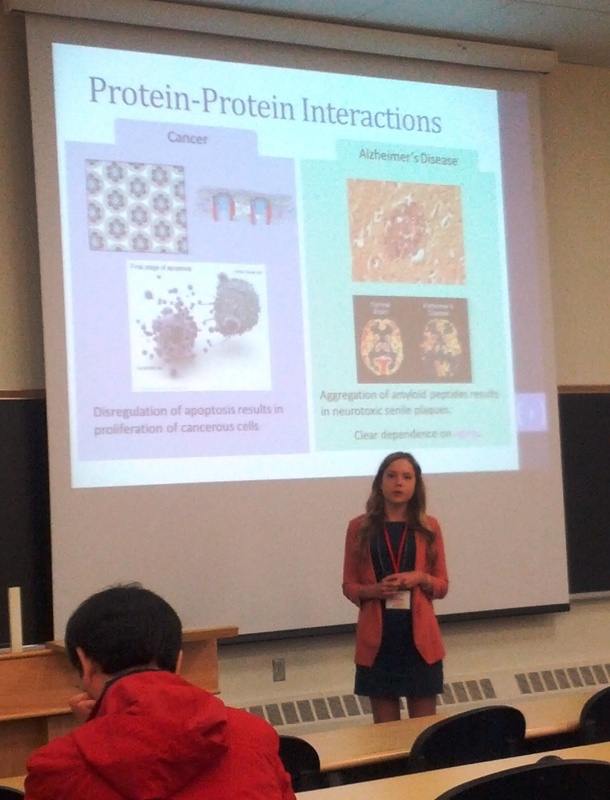 Hannah Dies is presenting her project 'The Interaction of Amyloid-β with Multicomponent Lipid Membranes' at the Canadian Undergraduate Physics Conference CUPC2013 hosted by McMaster. Congratulations, Hannah! Great talk! Hannah was also one of the organizers of this great conference. Prof. Rheinstadter is talking about 'Frontiers in Membrane Biophysics' at the NSLS-II Early Experiment Workshop specialized on inelastic X-ray scattering at Brookhaven National Laboratory. Rick Alsop has re-joined the group as Master's student. He will study the interaction between lipid membranes with common drugs. Welcome, Rick! Lily Zhang has joined the lab to study Giant Axonal Neuropathy. Welcome, Lily! Bonnie Cheung has joined the group for her Health Science Inquiry Project about Alzheimer's disease. Welcome, Bonnie! 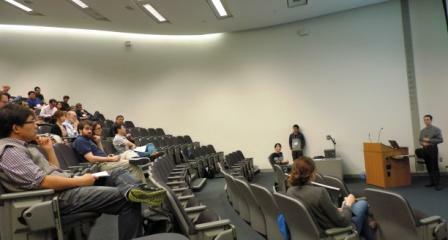 in Native Squid Pen" at Symposium day @McMaster and gave a very nice talk. Congratulations, Fei-Chi! Laura and Maikel are presenting at the AMMCS 2013 in Waterloo. 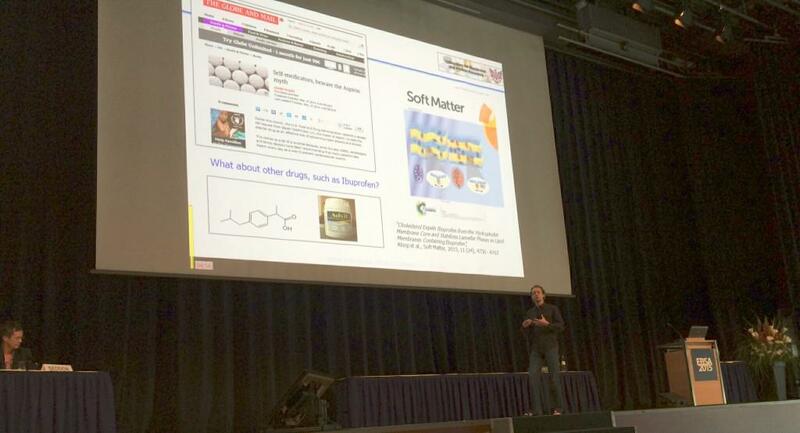 Cristiano Dias organized a special session 'Simulations in Soft Matter and Molecular Bio-Physics'. Thanks for inviting us, Cristiano! Laura and Maikel are conducting experiments at CNBC at Chalk River at the moment. Thanks ton, Zahra, for having us and all your help! Small science on big machines! 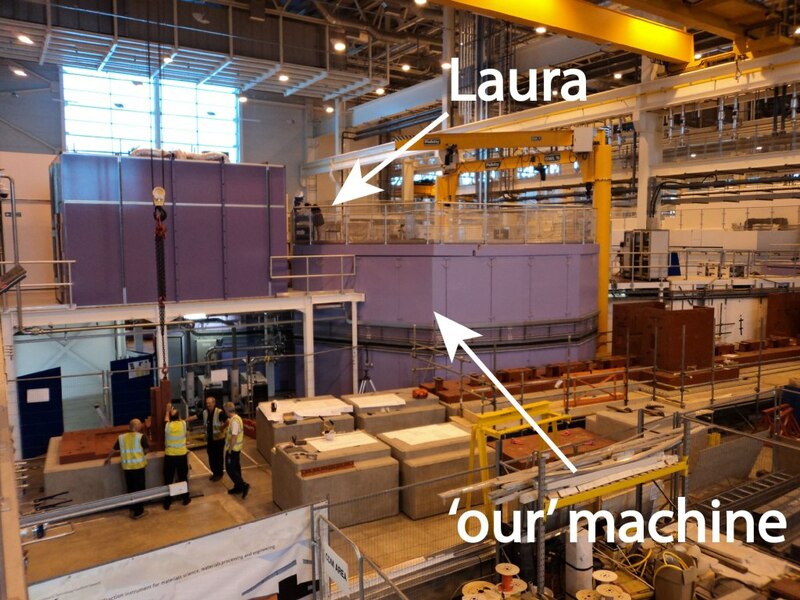 Laura and Maikel are currently conducting a neutron experiment using LET at ISIS in the UK. Thanks for having us, Vicky, and thanks to Rob B. and Rob D. for local contacting! Laura's paper "Static Magnetic Fields Enhance Lipid Order in Native Plant Plasma Membrane" (Soft Matter, 2013, 9, 6804 (2013), PDF) has been Featured in the Soft Matter Emerging Investigators themed issue 2013. Laura Toppozini was awarded a very prestigious NSERC-CGS Scholarship! Congratulations, Laura!!! Hannah Dies was awarded the Gladys A. Young Scholarship. Congratulations, Hannah; well deserved! Hannah is the face of McMaster USRA! The research teams of Drs. Cecile Fradin, An-Chang Shi, Paul Higgs, Kari Dalnoki-Veress and Maikel Rheinstadter organized a two day workshop at the WestWind Inn. 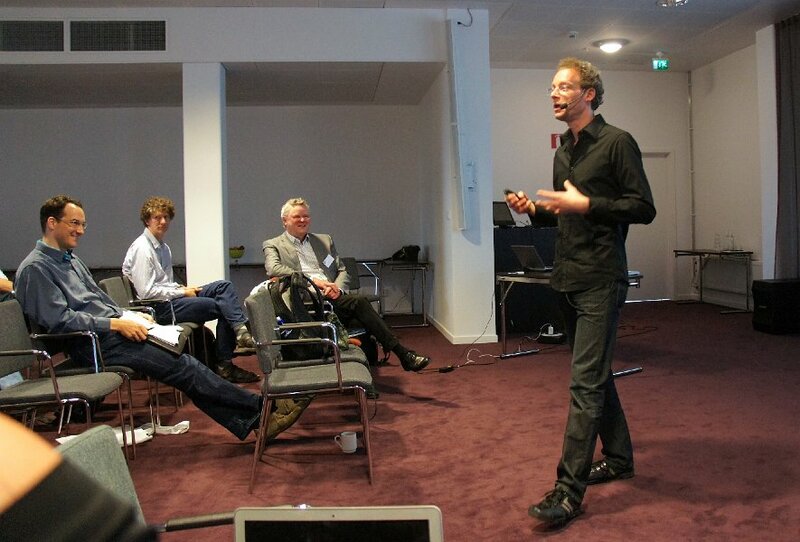 Prof. Rheinstadter is invited to present at the Neutrons and Life Sciences Conference in Lund, Sweden. Thanks, Hanna Wacklin, for the invitation and the organization of this great meeting! Maikel is visiting the ESS! Dr. Rheinstadter is visiting the Niels Bohr Institute in Copenhagen to meet with Prof. Thomas Heimburg. Thomas and Maikel are writing History! Farewell BBQ for Clare! All the best for you! Clare defended her PhD today. Congratulations, Dr Clare! Laura Toppozini was awarded an NSERC PGS post graduate scholarship for her PhD work in the Laboratory for Membrane and Protein Dynamics! Congratulations, Laura! Hannah Dies was awarded an NSERC USRA to work in our lab during the summer. Congratulations, Hannah! Well deserved and we are very much looking forward to having you! Fei-Chi is investigating molecular chitin structure of squid pen! Clare Armstrong is the speaker of the Physics Colloquium at Brock University. 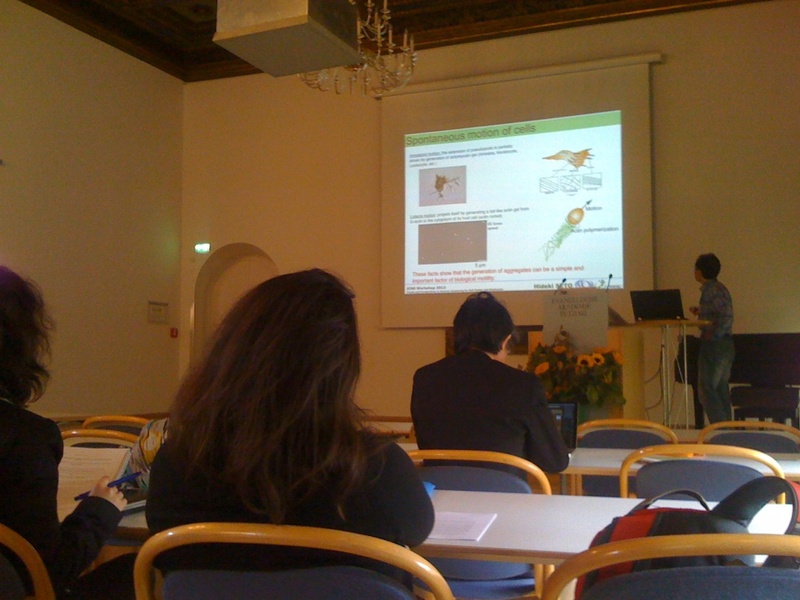 She is talking about "Frontiers in Membrane Biophysics". Laura Toppozini was awarded the Queen Elizabeth II Graduate Scholarships in Science and Technology. Congratulations! Well deserved, Laura! 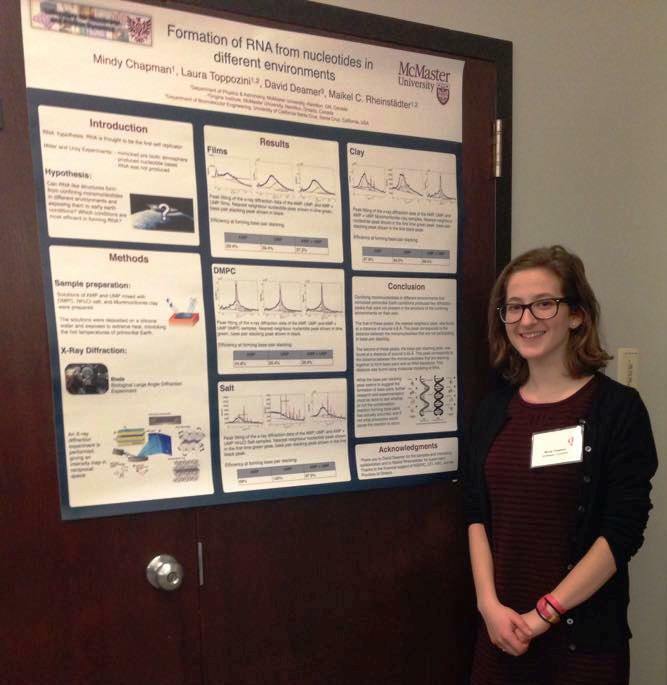 Hannah presented a beautiful poster at the NSERC-USRA poster session on the projects she worked on over summer. Congratulations, fantastic job, Hannah!!! Hannah also attended the CUPC 2012 in Vancouver ! 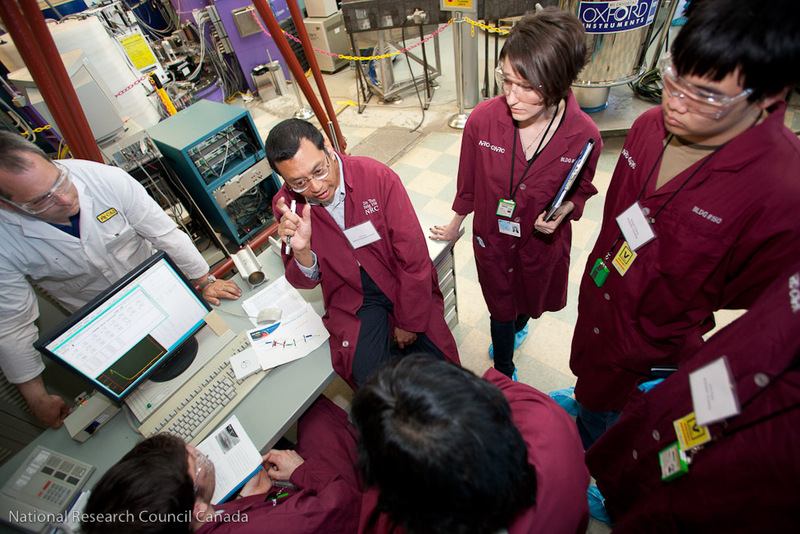 Clare, Laura, Fei-Chi and Maikel are presenting at the Annual General Meeting 2012 of the Canadian Institute for Neutron Scattering (CINS) at Brock University. Thanks for the great organization to Thad and Drew! Maikel gave an overview of the work done in the Laboratory for Membrane and Protein Dynamics. 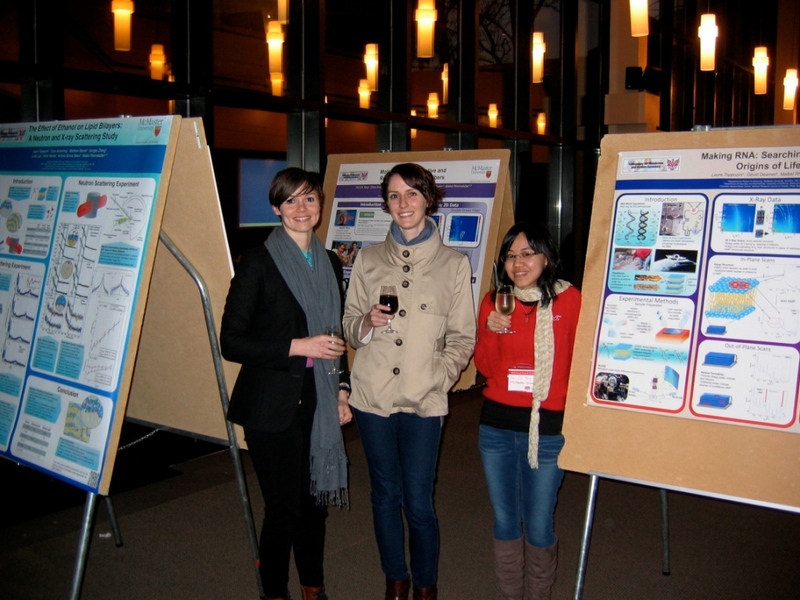 Clare, Laura and Fei-Chi had beautiful posters. Clare won the award for the best poster. Congratulations!!! 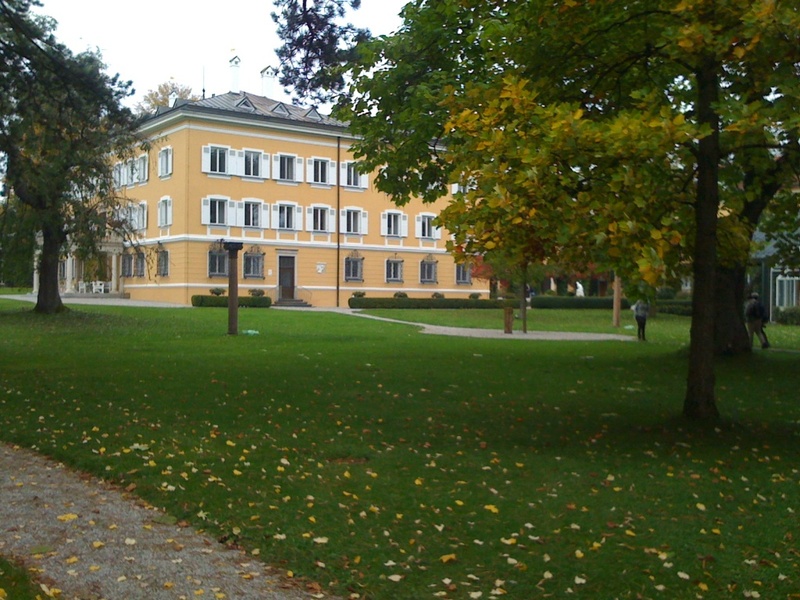 Clare and Maikel are invited to present at the JCNS Workshop 2012: Trends and Perspectives in Neutron Scattering for Soft Matter and Biophysics at the Evangelische Akademie in Tutzing, close to Munich. This was a very inspiring meeting. We also visited the FRMII reactor at the Technical University and JCNS! Fei-Chi is joining our group to work on her Master's degree. 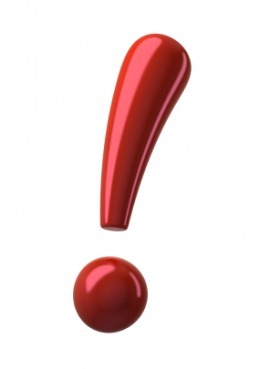 Welcome; we are very excited! We are conducting a neutron scattering experiment at Chalk River. We have a high cholesterol membrane on N5 to hopefully decipher the molecular structure of the liquid ordered phase. We are currently conducting a neutron spin-echo experiment at the NIST Center for Neutron Research at Gaithersburg with Antonio and Michi. 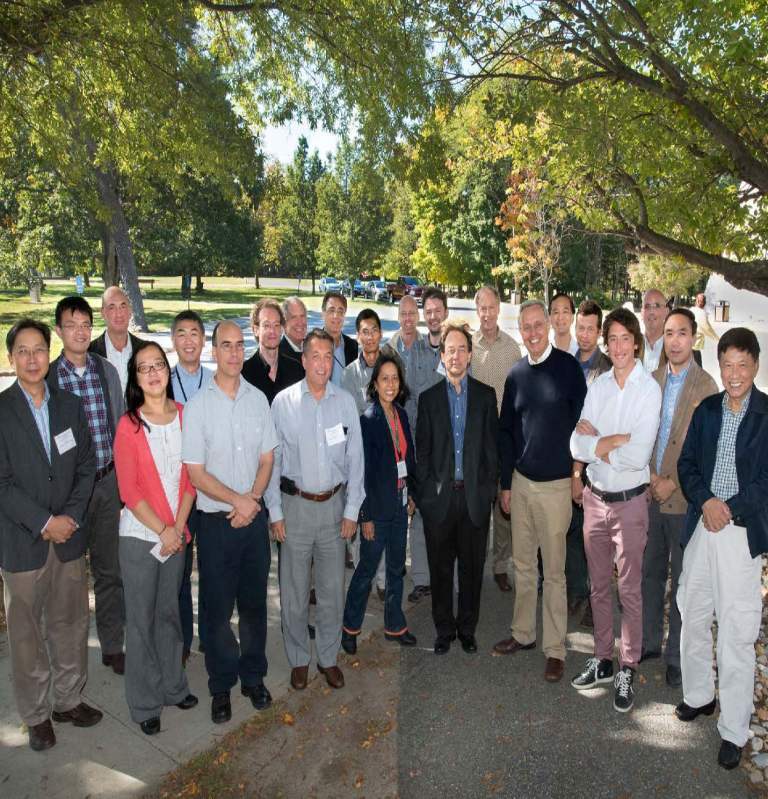 We attended the American Conference on Neutron Scattering 2012 at the Georgetown University in Washington DC. 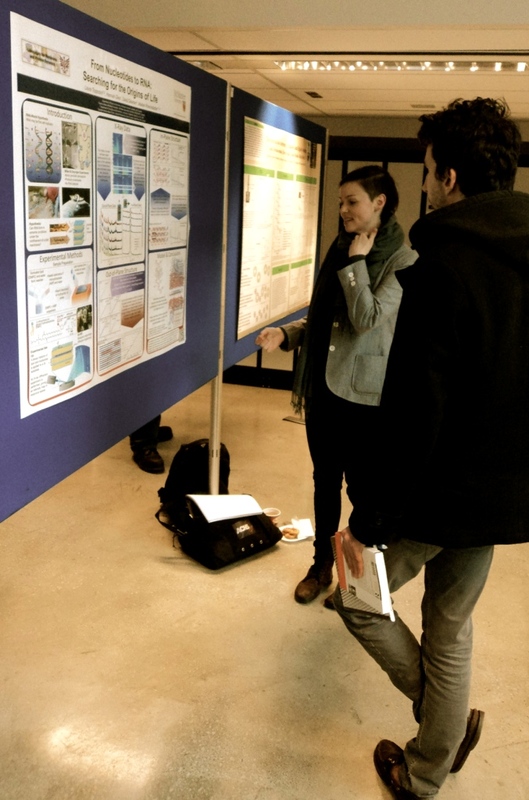 Laura: Poster (about ethanol in membranes), perfect! Matt: Talk (about chain formation in ferrofluids), perfect! Clare: Talk (about nanodomains in membranes), perfect! Matt Barrett is now Master Matt! Congratulations to your Master's degree. Title of his thesis is "Structure and Dynamics of Model Systems: From Ferrofluids to Brain Membranes"
Hannah Dies is the recipient of a NSERC USRA award to do research in our lab over the summer. Congratulations and welcome, Hannah! Richard Alsop is joining our lab to conduct his 4th year thesis in experimental biophysics. Welcome! Prof. Rheinstadter is invited to give a lecture at the 8th European Biophysics Congress (EBSA2011) in Budapest. This was a very stimulating meeting at a fantastic location! Laura Toppozini is joining the team as PhD student. Great to have you, Laura! Martin Kaye has very successfully defended his Master's thesis. Congratulations, Master Martin!!! Frontier Science with X-ray Correlation Spectroscopies using Continuous Sources at Cornell University, Ithaca NY. Great meeting; thanks for organizing, Arthur! 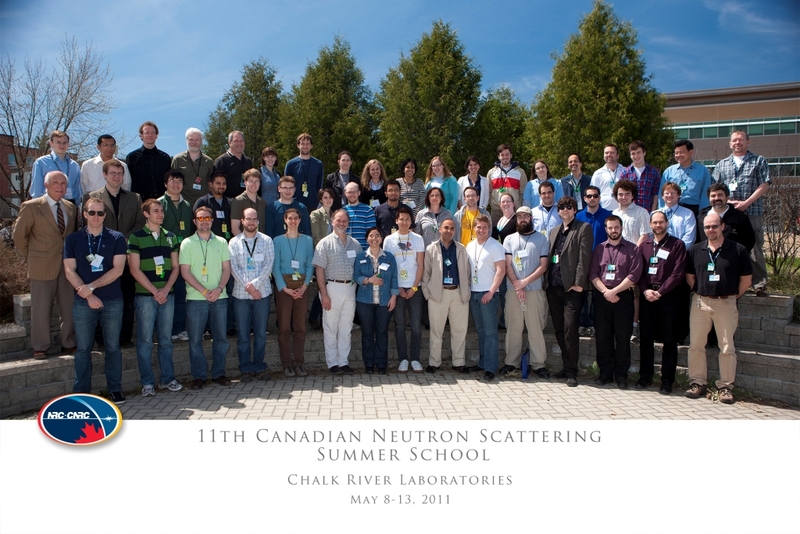 We (Clare, Martin, Matt, Songbo and Maikel) are attending the 11th Canadian Neutron Scattering Summer School of the Canadian Institute for Neutron Scattering at Chalk River. 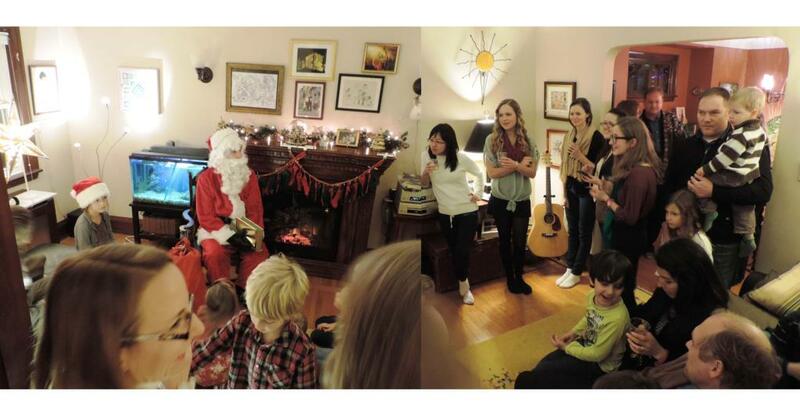 Thank you so much for organizing, Zahra! 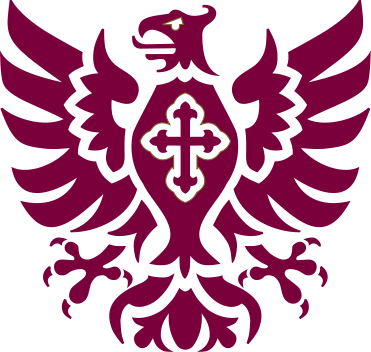 This is a great school! Clare Armstrong and Matthew Barrett have both been awarded an Ontario Graduate Scholarship (OGS) for their work with proteins in our lab! Congratulations!!! Clare Armstrong, Martin Kaye and Matt Barrett have presented their work in talks at the 2011 APS March Meeting in Dallas. Clare Armstrong is the recipient of one (of only 6!) of the 2011 March Meeting Travel Awards of the Division of Biological Physics. Enjoy Dallas! Clare Armstrong has been awarded an "Ann Poucher Windsor Queen Elizabeth II Graduate Scholarship in Science and Technology". Congratulations! Well deserved, Clare! Songbo Zheng has been awarded an NSERC Undergraduate Student Research Awards Program to conduct summer research in our lab. Congratulations, Songbo! Well done! Prof. Rheinstadter is invited to present at BILL2011. This is a very exciting and stimulating meeting which brings together the experts in our field. (http://www.ill.eu/news-events/events/bill2011/programme/) Thanks for organizing, Giovanna! Excellent meeting! We welcome Songbo Zheng in our team! Songbo will study structure of Alzheimer's membranes in our lab. We wish everybody Happy Holidays and a Happy New Year 2011! Prof. Rheinstadter was serving on a thesis committee in Grenoble, France. Congratulations, Dr. Marcus Trapp! Well done! We are currently running an experiment at the Cold Neutron Chopper Spectrometer at the SNS. Experimental team Clare, Martin, Maikel, Dr. Karin Schmalzl from the ILL in Grenoble, and Dr. Thomas Hauss from the Helmholtz Zentrum Berlin. Stay tuned for exciting data! 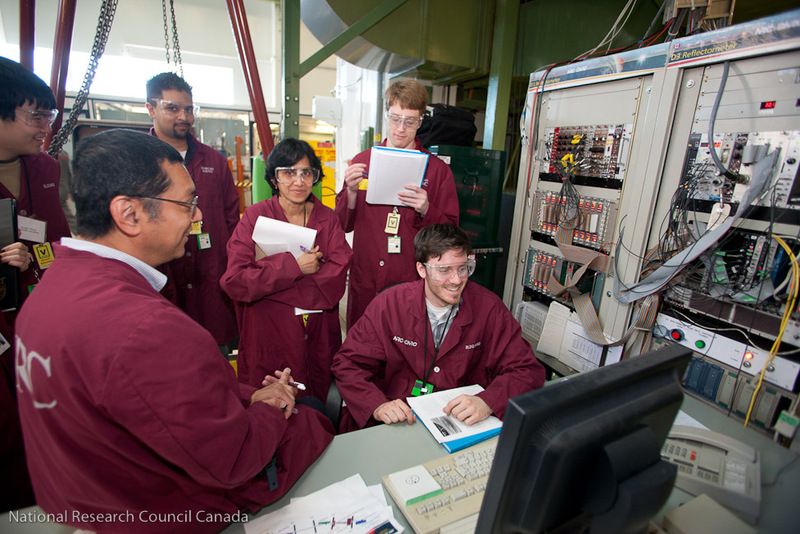 We conducted the first neutron scattering experiment at the Canadian Neutron Beam Centre at Chalk River after NRU's long shutdown. In a very exciting experiment we were able to observe nanodomains in lipid membranes. We are very happy that the neutrons are back to Canada! 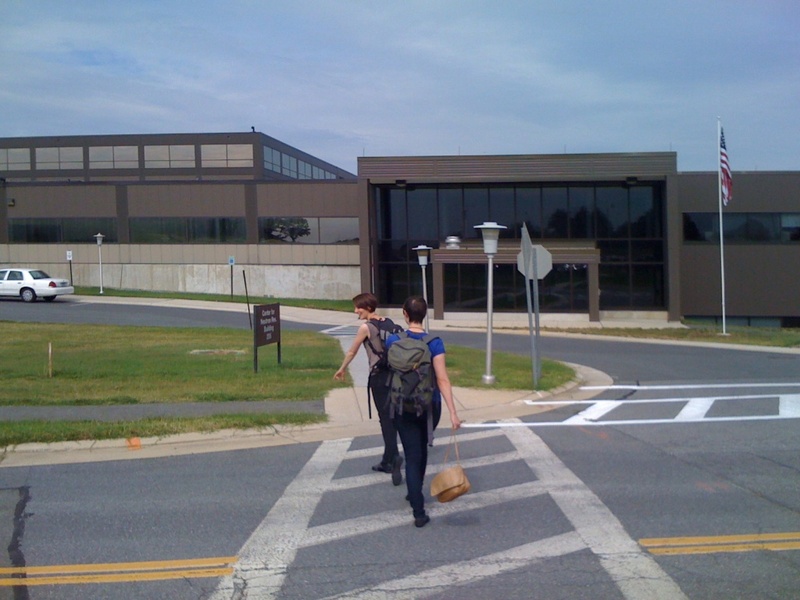 Nick Jago and Michael Moore joined the lab to conduct their senior thesis. Great to have you! 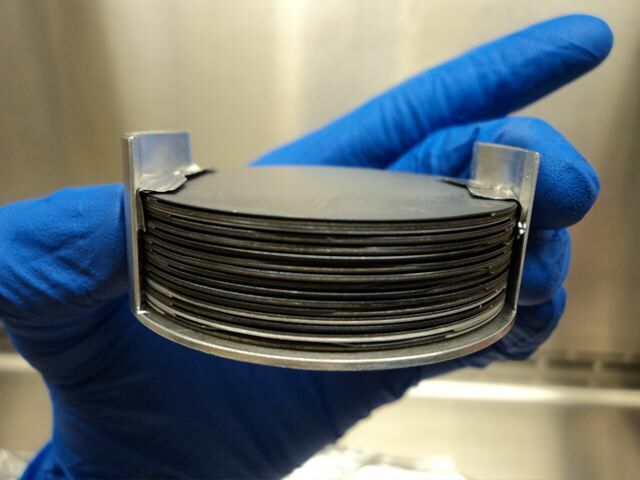 They will develop protocols to make model brain membranes and conduct and analyze the first x-ray experiments on iX, our brand new membrane diffractometer. Construction of our lab, the CFI funded Laboratory for Membrane and Protein Dynamics is almost completed. 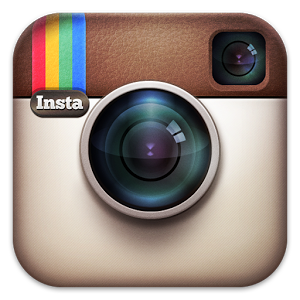 Check out the lab pages and stay tuned! Matthew Barrett has joined our group. Welcome! He will first work a magnetic fluids before going bio and preparing model brain membranes and model Alzheimer's plaques. Prof. Rheinstadter is teaching at the CIFAR Summer Forum on Interdisciplinary Nano Science, June 13-17, 2010, University of Alberta, Edmonton, Canada. Clare Armstrong received the award for The Best Student Oral Presentation at the 2010 CAP Congress. Congratulations!!! 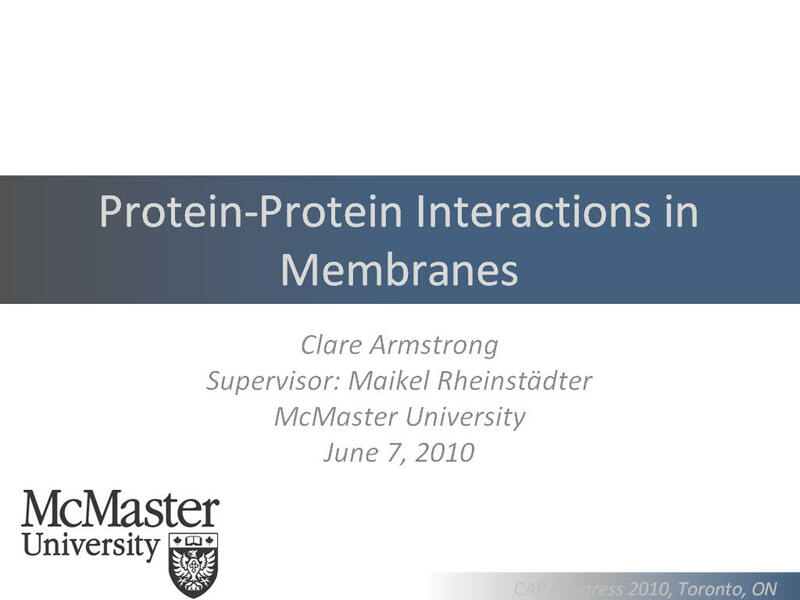 Clare's presentation "Protein-Protein Interactions in Membranes" has been selected as best presentation in the Division of Medical and Biological Physics before entering the final competition. 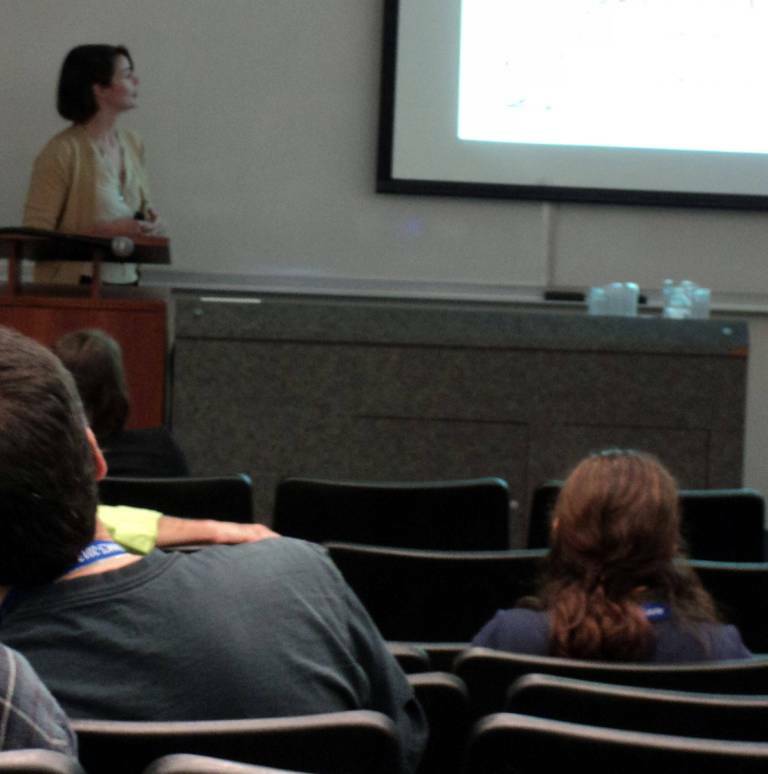 Clare Armstrong and Martin Kaye have presentations at the American Conference on Neutron Scattering (ACNS) 2010 in Ottawa. 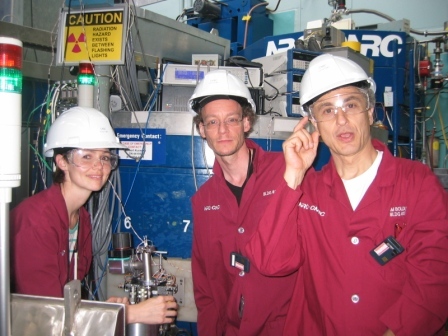 Clare Armstrong, Martin Kaye and Maikel Rheinst�dter have presentations at the Canadian Association of Physicists (CAP) Congress 2010 in Toronto. Clare Armstrong's beam time proposal "Concerted protein dynamics of bacteriorhopdopsin in purple membrane" has been awarded 6 days of beam time on the Cold Neutron Chopper Spectrometer (CNCS) at the Spallation Neutron Source (SNS). Congratulations! 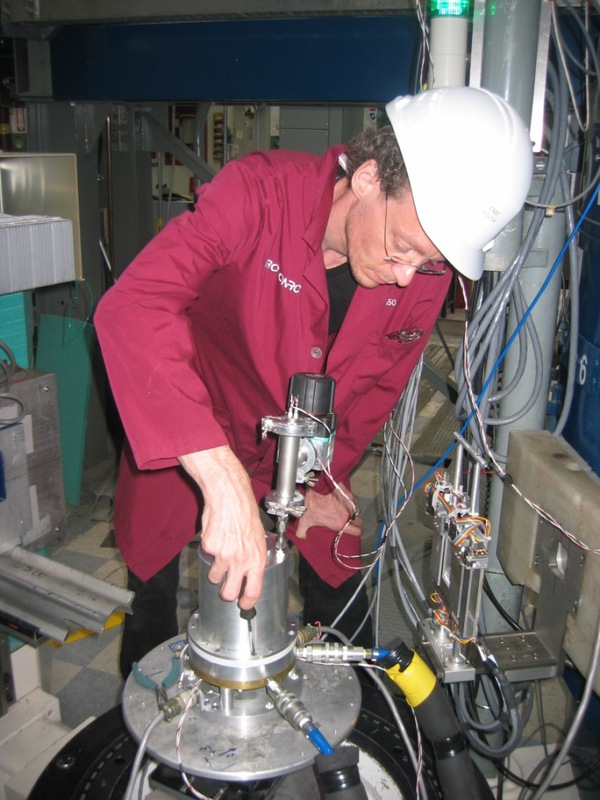 Prof. Rheinstadter has been appointed Member of the Science Review Committee for the Oak Ridge National Laboratory�s (ORNL) neutron scattering facilities. Our Laboratory has been awarded a grant by the Canada Foundation for Innovation's (CFI) Leaders Opportunity Fund. 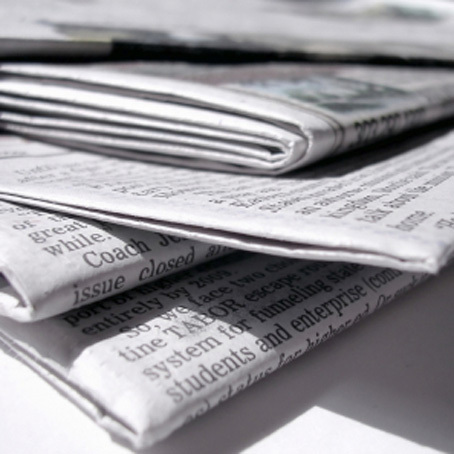 Read the Daily News article. Our neutron beam time proposal "Proteins at work: light-induced protein dynamics of bacteriorhopdopsin in purple membrane" has been awarded 14 days of beam time on the triple-axis spectrometer V2/FLEX at the Berlin Neutron Scattering Center. Allocation of beam time is a very competitive process and we are very happy. Congratulations! The Soft-Matter and Biophysics group at McMaster organized its first SoftmatterBio@MAC Retreat, November 27-28, 2009.